We recently published an article in the Journal of Drugs in Dermatology on the use of Picosure Focus Lens for areas off of the face such as the delicate tissue of the chest and the back of the hands which tend to show aging from sun related issues. This Charlotte, North Carolina female participated in the study to help diminish pigmentation and fine lines and wrinkles. Sun damage not only affects our face, but also can give pigmentary issues and wrinkling to our chest area. 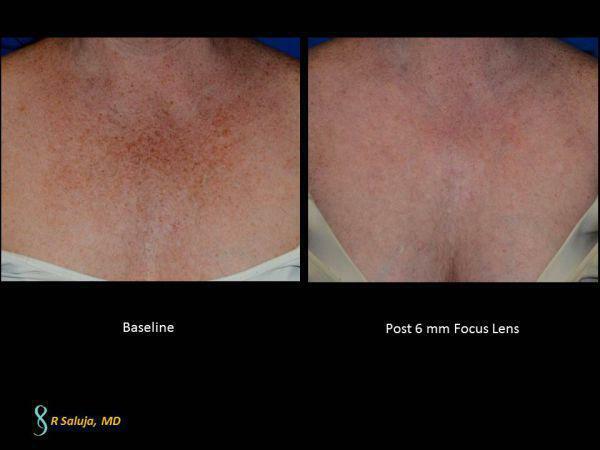 With 3-5 treatments with the Picosure Focus Lens, not only is pigment reduced, but collagen can be augmented. Here is a Charlotte, North Carolina female who desired treatment to help reduce the pigment and wrinkles on the decolletage.